One of the few players who could match up and effectively shut down the great ‘Newsy’ Lalonde, Willis Patchell was perhaps best remembered back in his day for his incredible and inspiring comeback effort after being wounded during the First World War. He made his professional debut in 1914 with the New Westminster Salmonbellies and played in 6 games that season alternating between coverpoint and first defence. The coverpoint, the second deepest defender on the field, would be his usual position although he could fill in at first defence and point when occasion required. The First World War would then take him away from the playing field for the next three or so years. It almost took him away from the game permanently. A member of the 29th Battalion from British Columbia, Patchell suffered a broken right leg during the intense fighting on the Western Front in 1916. Doctors said that he would never play lacrosse again, yet he persevered and returned to the playing field two years later when lacrosse action resumed on the Pacific Coast in 1918 – the long, jagged scars on his leg the only evidence on the field of his wounds. From 1918 onward, Patchell would play in six of the following seven professional seasons between 1918 and 1924. He was absent completely from the 1922 season and he then signed with Vancouver late in the 1923 season. The Terminals were having roster problems with some absentee bodies in their defensive zone and were desperate for help. While he showed some rust in his first game, no doubt on account of his long lay-off, it was felt Patchell could nevertheless provide some needed veteran experience to the Vancouver squad. He played the month of September 1923, suiting up three times for the Vancouver Terminals. He then returned to the Salmonbellies the next year, in what turned out to be the final professional season played on the Pacific Coast. His professional field lacrosse career would see him play in 62 games – all but 3 of them played with New Westminster Salmonbellies. He managed to score one lone goal – which came on July 25, 1921. His 18 penalty infractions clocked up 81 minutes to his name. Willis Patchell would win four Minto Cup professional championships, although two of them – in 1914 and 1924, his first and last professional seasons – were won by New Westminster through defaults. Patchell would regain his amateur status in 1927 and return to play for New Westminster Senior ‘A’ teams – first the Salmonbellies, and then later, the Adanacs – to extend his lengthy career which would span 20 years. He then followed up with another 11 years during when he would intermittently suit up in what must have been emergency situations. During that time he witnessed the transition from the old field game to the faster box version. His final 2 games were played in 1945, at the age of 52 for the New Westminster Adanacs, to book-end a senior career which had begun its first chapter some 31 years previous. Not a bad career for someone who was told he was done in 1917. 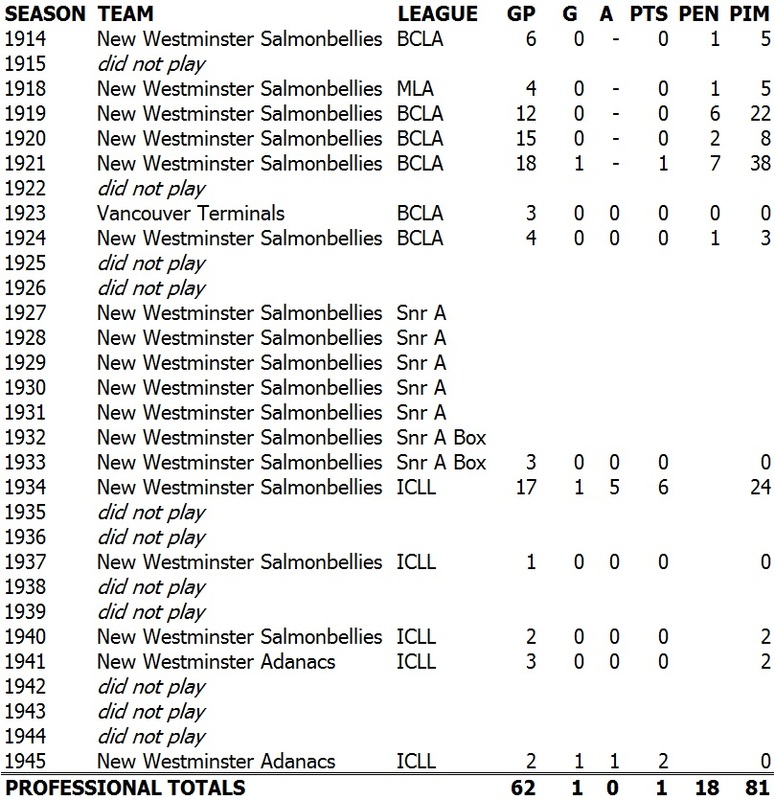 Willis Patchell played on the 1928 New Westminster Salmonbellies senior team that traveled to the Amsterdam Summer Olympics for the lacrosse demonstration. His brother Bill Patchell was the coach of the team – himself unable to play in the Olympics on account of his former professional status not yet rescinded like his younger brother. A fireman by trade, he retired as assistant chief of the New Westminster Fire Department in 1953. Three years after his passing in 1973, Willis Patchell was inducted into the Canadian Lacrosse Hall of Fame in the field player category.